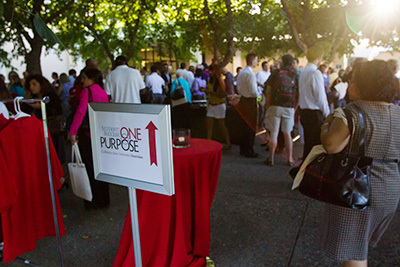 One Purpose, the new annual fundraising initiative at CSU Stanislaus, kicked off on Aug. 28. More than 300 volunteers have joined the effort, with a goal of raising $1 million for student scholarships in just six weeks. Nearly 100 CSU Stanislaus alumni are among those participating in the first year of the One Purpose campaign, representing a third of the total volunteer force. Their involvement shows an understanding of the value of pursuing an education, and as alumni they are a driving force in the community. Jacinto said he stays involved with his alma mater to renew his fond memories of being a student at CSU Stanislaus. Campaign volunteers have been coordinated into 24 teams that will be sharing the goal of One Purpose with the community. Each team is lead by a “team owner,” and half of this year’s teams are led by CSU Stanislaus alumni. Joining Jacinto as team owners is Sharon Silva, CEO and President of the Turlock Chamber of Commerce and also a member of the CSU Stanislaus Alumni Council. Every dollar raised through this year’s campaign will be distributed to CSU Stanislaus students as scholarships in the next academic year. The scholarships will be available to students across all majors, with academic excellence as the primary criteria. Students encouraged by scholarships have the ability to impact the community, Silva said.